The phrase "He is Risen" inevitably shows up this time of year in the form of Christian propaganda, and it has always grated on me. Thus, I figured I might as well mock it with the title of this post. Christians have co-opted a number of holidays, creating their own mythology around them to great effect. We atheists should be able to do the same minus all the religious nonsense, of course. And this is exactly what we have done with Zombie Jesus Day. The notion that Zombie Jesus returns each year on Easter Sunday and prowls the Earth devouring brains is a great story on which to base a holiday. It is fun, and it mocks the absurdity of the Easter story while containing a great metaphor (i.e., Zombie Jesus devours brains in much the same way Christianity seems to). What's not to like? 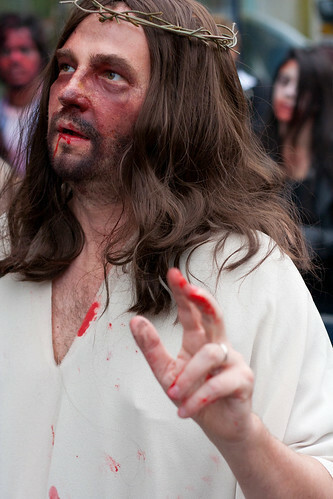 We all need an excuse for silly fun from time-to-time, and the growing popularity of Zombie Jesus events suggest that this particular one may be here to stay. And to the Christians who get upset over all the silliness, I'll just point out that the myth of Zombie Jesus really isn't any stranger than what you believe. And of course, we recognize that ours is a myth too.